In the previous year, Google made significant changes to their ranking algorithm. Discover how this can affect your fishing charter’s rankings and how to benefit from them. SEO has been a vital part of the success for many fishing charters. A successful SEO campaign will provide you with a constant stream of qualified leads around the clock. It will also help develop trust for your brand. Over the years Google search has been getting smarter. The days of keyword stuffing and linking to other fishing sites to get on page one of the SERPS (Search Engine Results Pages) are long gone. Today. Google has incorporated (AI) machine learning, user experience signals and mobile-first indexing into their ranking factors. By doing so, Google can weed out spammy, poorly design, un-updated websites and provide better results and experience to their users. Below, I describe each of these ranking factors and how you can benefit from them.. In 2018, Google introduced RankBrain. A machine learning system that helps Google determine how to rank websites based on user signals. RankBrain measures how users interact with the results and determine what order they rank them. One of the determining factors used is Dwell Time. The actual time a user spends on a website. The longer the dwell time, the better the signal sent back to RankBrain. 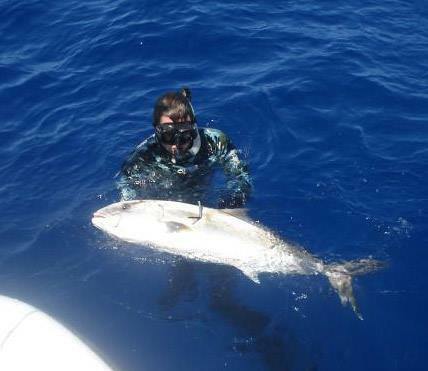 For example, I will use a client of ours, T-Kat Fishing Charter. Now, Let’s say, someone is searching for “Treasure Island Fishing Charters”. If the user clicked on the fourth result and when they arrived at the site. They didn’t stay and went back to the results to click on another site. Google would consider this action a negative signal and would drop their rankings. Let’s say the user clicked on the first result “T-Kat” and spent some time navigating their website. Google would consider this a positive signal and move their rankings up or in the case of T-Kat, keep them at #1. As you can see, there is a direct correlation to how someone interacts with your website and where you will be ranked. Another ranking factor Google rolled out in 2018 was mobile-first indexing. Now, Google considers the mobile version of your site as the real version. With a growing number of mobile users, you can understand why they did. To avoid having your fishing charter website’s rankings negatively affected by Google’s mobile-first indexing policy, follow the guideline I have provided below. There are many tools available online to help you grade and troubleshoot the performance of your website. One of the tools we like to use is GTmetrix.com. 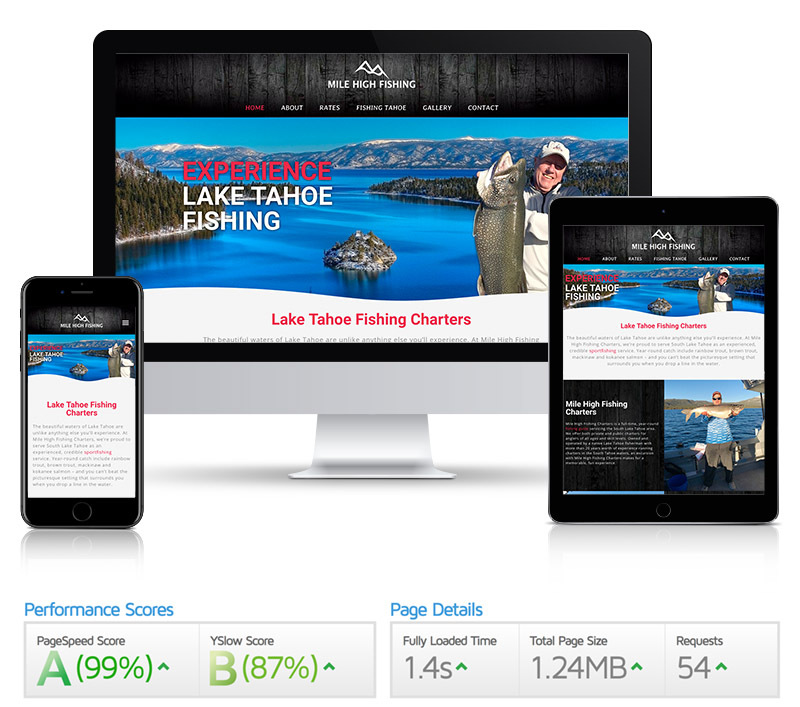 Below, is a snapshot of a performance report for one of our clients, Mile High Fishing Charters. Not long ago Google would analyses how many keywords would appear on a web page. As you are probably aware, a lot of people had abused this to get better rankings. The writing example above is redundant and doesn’t reflect well on your brand’s image. Google was well aware of this, and over time they improved their ability to understand the context of a webpage without having to rely too much on keywords. Keywords still play a part in Google’s Ranking Factor. However, you do not need to cram them in every sentence, heading or available space throughout your website. Doing so will probably get you a Google penalty. How to create web copy with better context? The answer is simple. Write, more in-depth comprehensive web copy. Google is looking to provide its users with the best possible answers to their questions. Read through your web copy and ask yourself? Would this answer the questions a user might have about my fishing trips? Does it contain enough clear information for them to want to proceed with booking my services? From our experience, improving an existing site’s web copy had an immediate benefit in Google’s SERPS. Is your websites copywriting out of date or needs improving, but you don’t have the time to do it yourself? Then reach out to us, we offer competitive rates and fast delivery for our writing service. One of the fastest forms of search is Voice Search. A recent study has stated, 41% of adults do a least one voice search a day. And, 20% of all mobile searches are voice search. Experts agree voice search will grow even more in 2019. 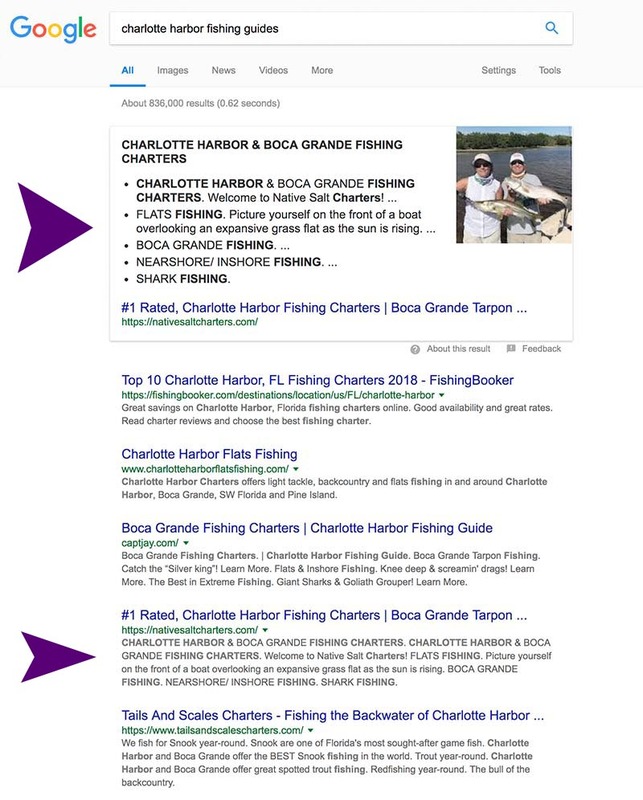 When you optimize your website for voice search, you have opened your fishing charter business to a brand new sales channel that most do not even know about it. In 2014, Google introduced Featured Snippets into the search results. A featured snippet gives a user a concise, direct answer to their question without having to click onto a website. Google takes what they consider the best answer directly from a site listed in one the first page of the SERPS. Having your website listed in a featured snippet is the absolute best way to gain more visitors. 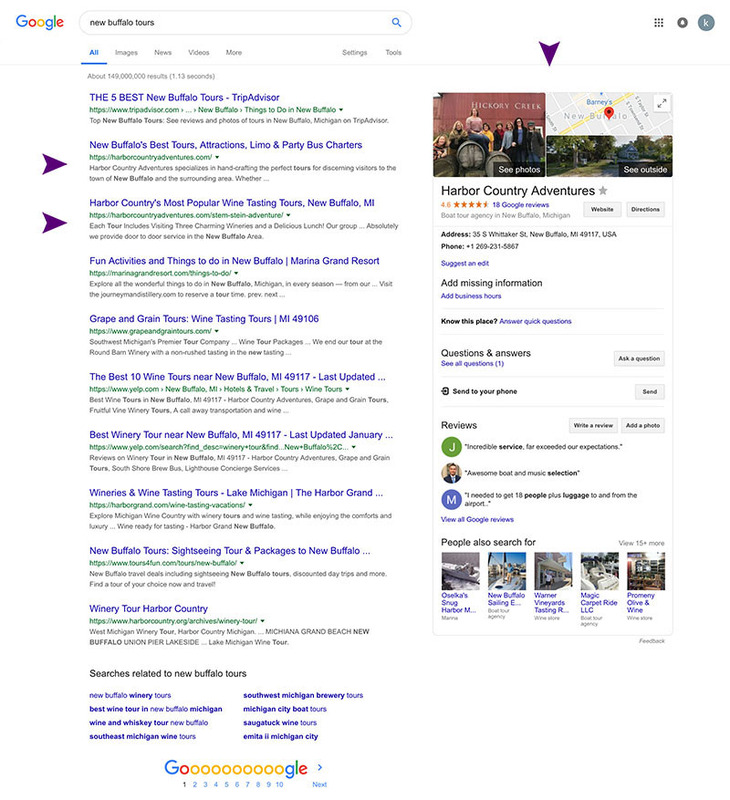 As you can see in the screenshot from one of our clients below, the featured snippet takes up most of the available real estate on the first page above the fold (the area of the page you see without having to scroll). Here is another featured snippet from a client of ours. 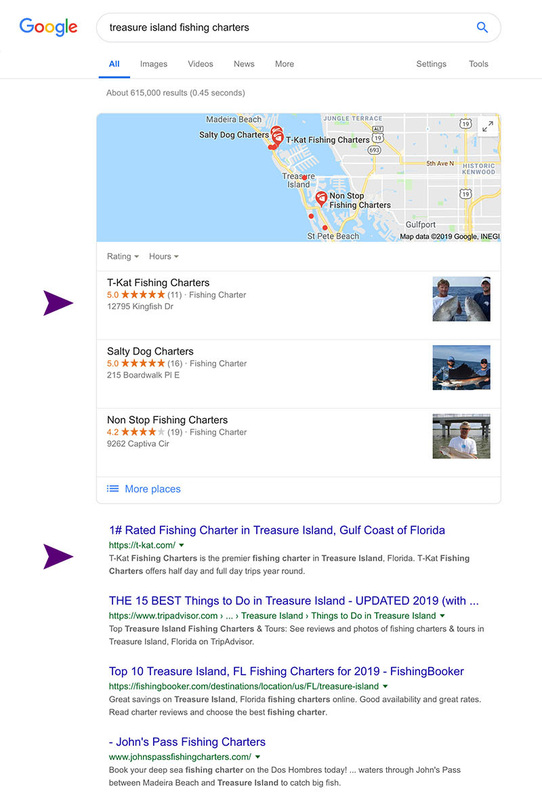 Again, it takes a good portion of the page above the fold, while standing out against the other fishing charters listed on the SERPS. Another type of featured snippets is one that highlights your company on the left side of the SERPS. This kind of featured snippet is the ultimate way to garner more clicks. Besides taken up over 50% of the SERPS, it adds trust. And, gaining a visitor’s trust is half the battle, to converting them into customers. We had achieved this kind of snippet for one of our clients for the keyword “New Buffalo Tours”. As you can see in the screenshot below, they are dominating that page. They also have two listings in the Top 3 spots. Currently, about 12% of all searched contain a featured snippet. This number is expected to increase in 2019 and coming years. With that said, it should be a priority for any business looking to gain business from search to get their site listed as a featured snippet. In the coming year, expect a greater influence from these ranking factors. Websites that are not producing positive user-signals are at risk of being dropped further back in the rankings. 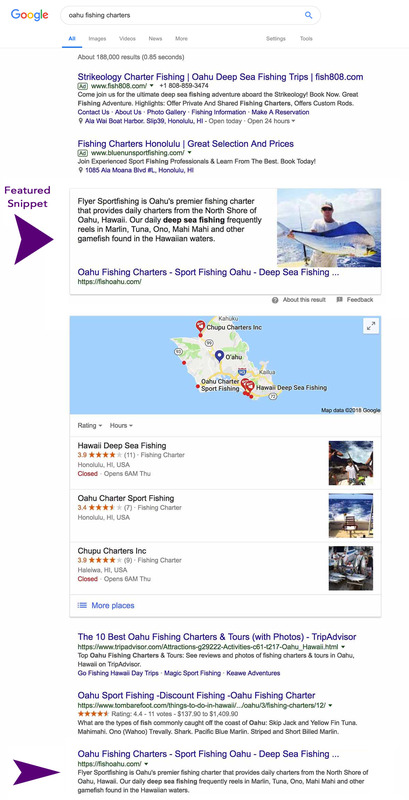 Applying these recommendations along with Google’s other ranking factors will help your chances of achieving higher rankings and a constant stream of qualified leads for your fishing charter. Finally, I would like to add that improving your user-experience will have a positive benefit on any form of marketing you are undertaking. Google has become a great indicator of your site’s performance, beyond just listing on the SERPS. Are you interested in taking advantage of these updates like our clients in the examples? Then get in touch with us today. We are running a special offer on our SEO service until the end of January. Signup to our newsletter and receive tips on how you can improve your online presence and blow the competition out of the water. Kevin created Moonshine so he can help businesses take advantage of the latest design and marketing trends. When not grinding away behind a desk you can usually find him in the water.